This page: Aladdin and Hulett. Logging near Hulett, approximately 1910. 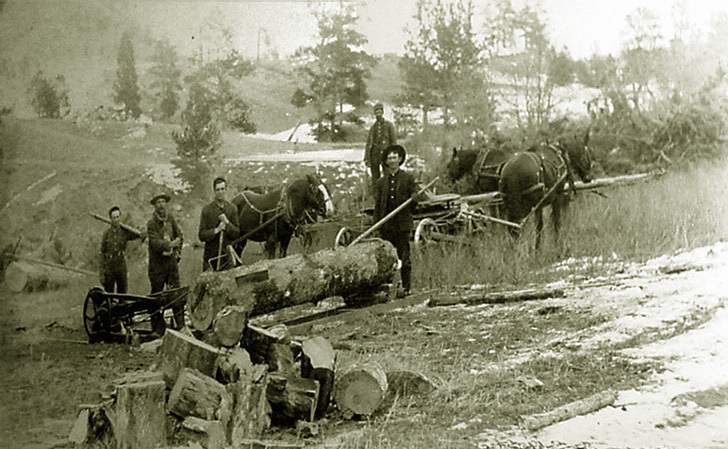 Following the discovery of gold near Deadwood, the Black Hills became a primary source of timber necessary for the gold mines. 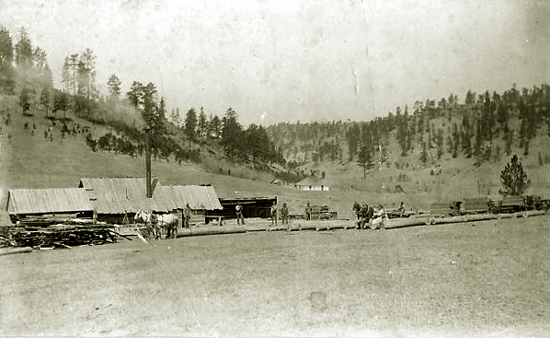 Because of transportation difficulties, most of the logging operations were on the Dakota side of the Black Hills. One of the areas in Wyoming where timbering took place was near Hulett on the Belle Fourche is the closest town to the Devils Tower. George Morrison's mill near Hulett, 1907. The Town of Hulett was named after Lewis Morgan Hulett (1830-1915). Hulett came to the Dakotas prior to the Civil War after his father was killed. In 1881, he moved to Wyoming and settled on the Little Missouri in the northern part of the Crook County. In 1886, he established a small store a short distance from present-day Hulett. With the store he was appointed as postmaster. Until then, the closest post office to the area was in Spearfish, Dakota Territory some 50 mies away. Later, Hulett moved back to the Little Missouri. By 1900, Hulett still consisted only of the store and two houses. 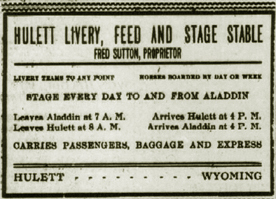 By 1904, lots had been platted and shortly afterwards it had two newspapers, The Wyoming Blade and the Inter-Mountain Globe; the Hulett Hotel operated by A. B. Pecht and and later by Lee A. Pearson; and various mercantiles including the Hulett Rochdale Company, Garman Bros. & Miller and Wood & Chaplin. Garman Bros. & Miller operated stores in both Bulett and Moorcroft. 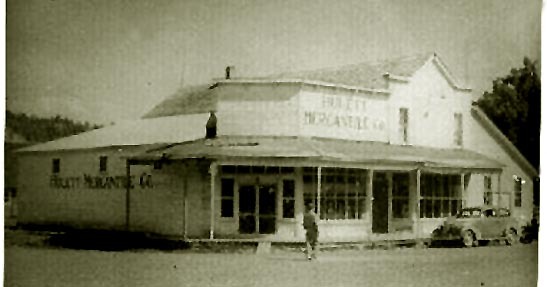 After one of the partners, C. P. Miller was killed in a motorcar accident, the two stores were split up, the store in Hulett becoming the Hulett Mercantile Company. and the store in Moorcroft becoming the Crook County Mercantile. The Mercantile Building, although modified, is still in existence. 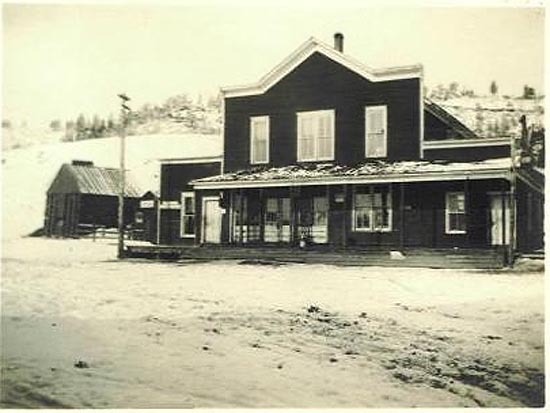 During the early 1920, the store was operated by George Grenier who later opened Grenier's store at Devils Tower. 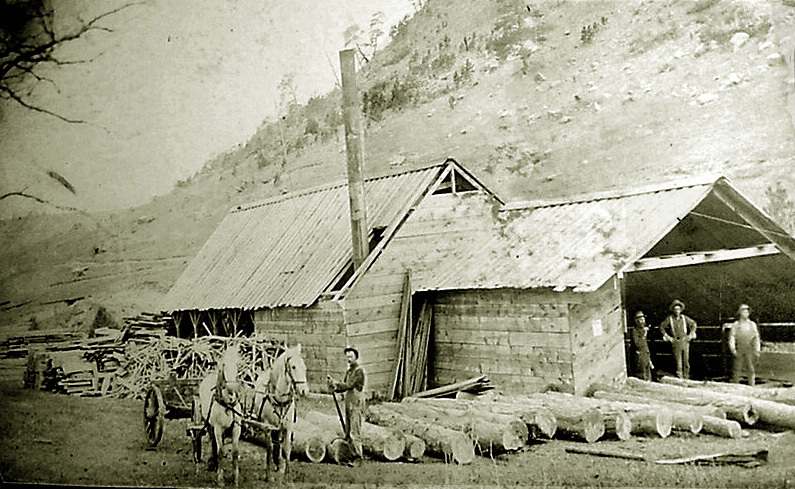 The above photo is believed to be of William Shier's sawmill which opened in 1910. Other sawmills in Crook County were located at Carlile and Downing. For a short period of time about 1908, John Youngman operated the Hulett Tie and Timber Company which floated railroad ties down the river to Belle Fourche. Chittin owned the Aladdin Livery Barn. The stage line was initially operated by W. A. Moore and later operated by William E. Tinkcom and by Fred Sutton. 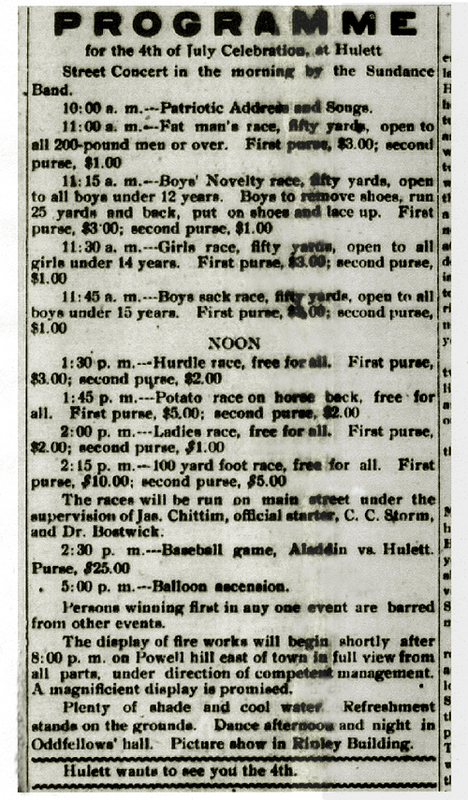 See 1914 advertisements below. In 1914,Tinkcom took over operation of the Hulett Hotel from Pearson. A month later, the hotel burned down. All of the guests were saved including one who was recovering from an appendectomy and had to be carried out on his mattress. Also lost in the fire was Pearson's restuarant, the De Lee; Fred Batton's barbershop; and the pool hall. The front of the bank was badly damaged. Sutton's livery barn, the Odd Fellows Hall, the office of of the Blade were scorched. Through the use of a bucket brigade manned by many of the women of the community the warehouse for the Crook County Mercantile and the other buildings listed above were saved. In 1925, in another fire, the Odd Fellows Hall burned down. Until the coming of the railroad in 1902, transportation for mail and freight in and out of the Black Hills was difficult. 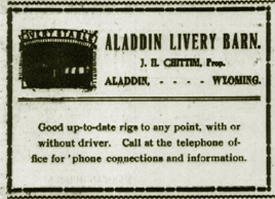 Until the 1020's mail and light goods continued to rely upon stages in the form of spring wagons such as depicted above.As indicated by the above advertisement, it took approximately 8 hours to go the 30 mies from Hulett to Aladdin. Stages still had a degree of risk. In 1915, Jim Walsh, a driver on the Hulett-Moorcroft stage had a runaway team. Jim and his passenger's ride between pines and over ditches ended only when the stage overturned. Local merchants such as R. K. Mespell's Carlile Store solicited mail and telephone orders. Any order over $5.00 would be delivered anywhere on the Hulett-Moorcroft Stage line without charge. Harry Kiefer won the Fat Man's Race with L. O. Glassbourne coming in second. Chas. Chittin won the boy's novelty race with Clarence Pearson second. Pearson, however, won the Potato Race. It was a blow out for the baseball game, Aladdin 14, Hulett 3. 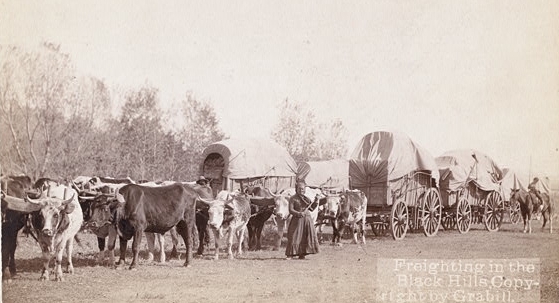 In the 1880's the largest freight line in the Black Hills was the Evans Transportation Line, owed by Fred T. Evans, which had 1,500 oxen, 250 mules, 400 Schuttler Wagons, and 150 men in its employ. 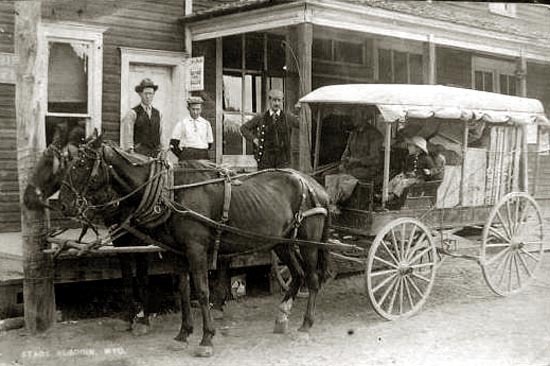 The primary wagons used in the Black Hills were "Chicago" wagons, manufactured by the Peter Schuttler Wagon Company of Chicago. 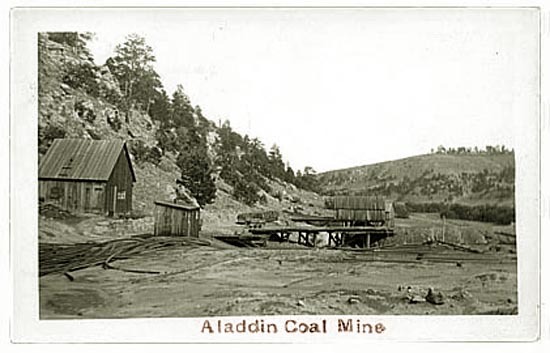 Aladdin, about 44 miles to the east of Devils Tower, was founded when reached by the Wyoming and Missouri River Railroad. Mahlon S. Kemmerer, first president of the Railroad and after whom Kemmerer is named, established the town. The railroad discontinued service in 1927. Parts of the railroad right-of-way are visible along Route 24. 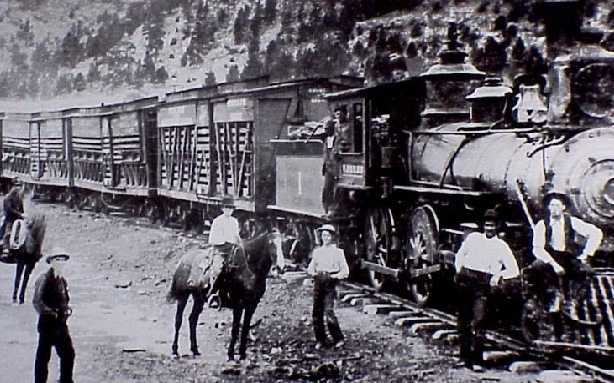 The railroad was one of a number of small railroads which pushed into the black Hills to bring out coal and lumber for the mines of Black Hills mining districts of South Dakota. Most were unsuccessful. Lawyer William T. Coad expended some $40,000.00 on railroad construction and went broke in the effort. Aliddin today has a population of 15. The Mercantile Building, built in 1896 and on the Historic Register, is still in business as a general store, not much changed except for the presence of an ice machine on the front porch. 1.2 miles east of Aladdin is the Aladdin Tipple where coal was mined until 1942 in the first underground mine in the area. The coal provided fuel for smelters in Lead and Deadwood, South Dakota. The tipple, hoist house and mine opening have now been restored and are part of an historical interpretive park. Four miles west of Aladdin may be seen ruts from Lt. Col. George A. Custer's 1874 expedition into the Black Hills. Next Page: Bill Gollins paintings.